Australia’s financial intelligence agency Austrac has taken legal action against betting giant Tabcorp  for noncompliance of anti-money laundering and counterterrorism financing laws. Austrac describes non-compliance as a potential risk to the integrity of Australia’s financial system , with the maximum penalty for this offence reaching $17 million. Greens leader and co-convenor of the Australian Parliamentary Group on Drugs Law Reform, Richard Di Natale, has called for a new approach to tackling drugs  based on ‘the Portuguese model’. Instead of being processed though the criminal system, Portuguese drug users are given access to drug treatment programs financed by the money saved from law enforcement. There’s some support for the Portuguese model across Parliament, with a Liberal spokeswoman acknowledging that the current process isn’t working, and a Labor spokesman supporting treating drugs as a health rather than criminal issue. NSW celebrates 100 years of women  in policing this week, with women responsible for ‘incredible’ cultural change since 1915. Women now comprise almost 35% of the force in areas as wide as the Mounted Police Unit and domestic violence liaison. Despite this progress, further efforts are needed to address the under representation of women on the force. This week, British Prime Minister David Cameron announced the UK’s five-year plan to combat extremism . At the core of the reforms is a promotion of liberal values across various levels of society. Ultimately, Cameron says, our values are the ‘strongest weapon’ against tackling extremism. See here  for a summary. Cameron’s strategy was praised  for recognising the need to win the battle of ideas. But focussing on ideology didn’t sit well  with counter-terrorism expert Professor Andrew Silke. He argues that ideology isn’t the key motivator that drives terrorists: it’s the desire to fight for a perceived worthy cause. A man detonated a bomb in eastern China on Monday , killing two people and injuring 24. Shannan Tiezzi at The Diplomat analyses  the incident in the context of a string of recent suicide bombings in China, concluding that many weren’t acts of terrorism. Unlike the attacks in Xinjiang perpetrated by ethnic Uyghurs, the majority of suicide bombings in China are driven by personal grievances against the local government. While most eyes are on terrorism in the Middle East, Africa’s got a new problem—‘Islamism is the continent’s new ideology of protest’. The Economist maps  how various extremist groups are spreading throughout Africa, exploiting Islamism’s ability to transcend tribal dynamics. 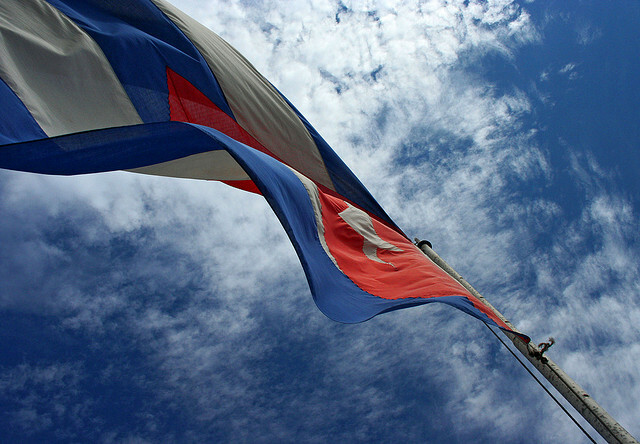 On Monday, the Cuban flag was raised  over Havana’s embassy in Washington for the first time in 54 years. After two years of negotiation, The United States and Cuba formally restored diplomatic relations despite the commercial embargo remaining in place. This symbolic move marks a new post-Cold War era for both countries, as does the US removing Cuba from its list  of state sponsors of terrorism. While re-established diplomatic ties were praised by Cubans in the US, some in Cuba fear this could be the beginning of the end  of the ‘wet foot, dry foot’ policy  which grants Cubans reaching American soil residential status. With only 150 kilometres  separating the countries, it’s expected that illegal migration flows will increase. Earlier this year, Checkpoint commented on Ankara’s concerns over possible terrorist attacks on Turkish soil amidst demographic changes along its Syrian border . On Monday, in what the Government described  the first Islamic State (IS) attack in Turkey , more than 30 people were killed and 100 injured in the Kurdish border town of Suruc. This has rushed the Government to increase security  to reduce risks and ease tensions among Kurdish people who accused Ankara  of failing to do more to stop IS. Clare Murphy is a researcher in ASPI’s Strategic Policing and Law Enforcement Program. Stephanie Huang is an intern at ASPI. Cesar Alvarez is a visiting fellow at ASPI. Image courtesy of Flickr user Lucía Martínez.